As a first post it makes sense to cover one of the more useful Arduino applications: Communication via bluetooth. There are several methods of transferring data over from one Arduino board to another such as RF modules, Bluetooth modules, Zigbee etc. Selecting a wireless communication module will depend on the range between devices, the frequency and amount of data transferred. 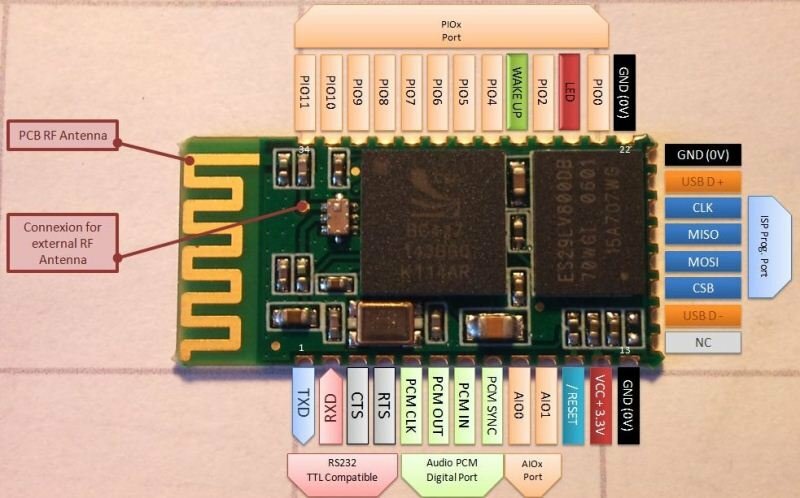 The HC-05 bluetooth module is a good solution for short range communication. Start by connecting the RX and TX pins on the bluetooth module to the RX and TX pins on the Arduino. Next Connect the 3.3V pin to the 3.3V pin of the Arduino, the ground pin to ground and the Reset pin on the BT module to pin 12 of the Arduino. Finally, connect the PIO11 pin to digital pin 8 on the Arduino. The same configuration should be used for Arduino #2. Now that we have 2 Arduino boards, each setup with its own bluetooth module programming can begin. The code below transmits the letters a and b, one after the other, at one second intervals. The Arduino will transmit one character at a time therefore, for long messages it might be useful to embed key characters into the message being sent to distinguish between data/words/phrases/sentences; ex. If you transmit accelerometer data for x,y and z axis with values 12, 15, 0, this message will be received as "1" "2" "1" "5" "0", one character at a time. To distinguish between each angle value the message sent can be in the form "12,15,0f". Using this setup the comma (,) character can be used to distinguish between each angle and the "f" character can identify the end of the message. These values can be easily stored into an array and displayed after all angle values have been received. *Note: give adequate time between sent messages to avoid missed characters on the receiver side.